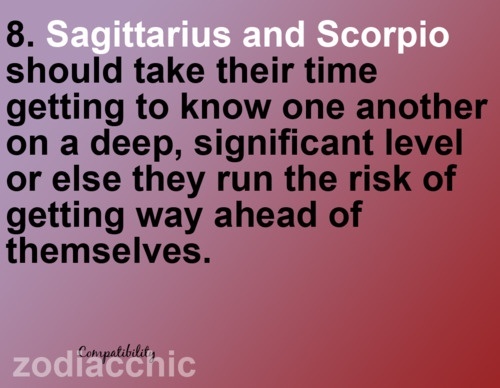 Sagittarius and Scorpio should take their time getting to know one another on a deep, significant level or else they run the risk of getting way ahead of themselves. If Sagittarius is in the mood to settle down in this Scorpio love match, Scorpio will find this mate to be intellectually and sexually satisfying. 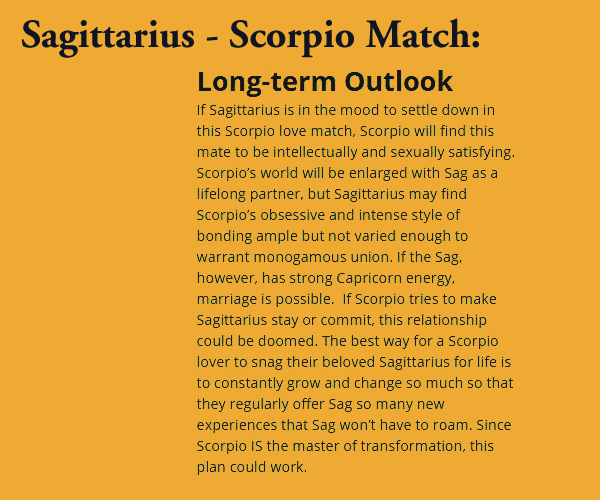 Scorpio’s world will be enlarged with Sag as a lifelong partner, but Sagittarius may find Scorpio’s obsessive and intense style of bonding ample but not varied enough to warrant monogamous union. If the Sag, however, has strong Capricorn energy, marriage is possible. 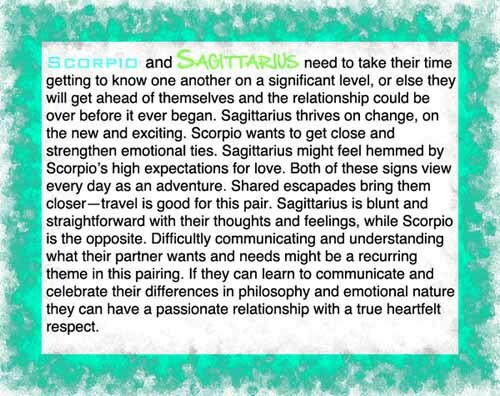 If Scorpio tries to make Sagittarius stay or commit, this relationship could be doomed. The best way for a Scorpio lover to snag their beloved Sagittarius for life is to constantly grow and change so much so that they regularly offer Sag so many new experiences that Sag won’t have to roam. Since Scorpio IS the master of transformation, this plan could work. Scorpio and Sagittarius need to take their time getting to know one another on a significant level, or else they will get ahead of themselves and the relationship could be over before it ever began. Sagittarius thrives on change, on the new and exciting. Scorpio wants to get close and strengthen emotional ties. Sagittarius might feel hemmed by Scorpio's high expectations for love. Both of these signs view everyday as an adventure. Shared escapades bring them closer - travel is good for this pair. Sagittarius is blunt and straightforward with their thoughts and feelings, while Scorpio is the opposite. Difficulty communicating and understanding what their parner wants and needs might be a recurring theme in this pairing. If they can learn to communicate and celebrate their differences in philosophy and emotional nature, they can have a passionate relationship with a true heartfelt respect. Scorpio can be quite sensitive and are easily hurt and will feel drawn to the kindness and reliability of Sagittarius. Sagittarius will be intrigued with the mysterious Scorpio and will try their best to dig deeper into the Scorpio heart. If you're going to try and make this union work, you better make sure there's a lot of love and understanding, as well as a big capacity to forgive and forget. 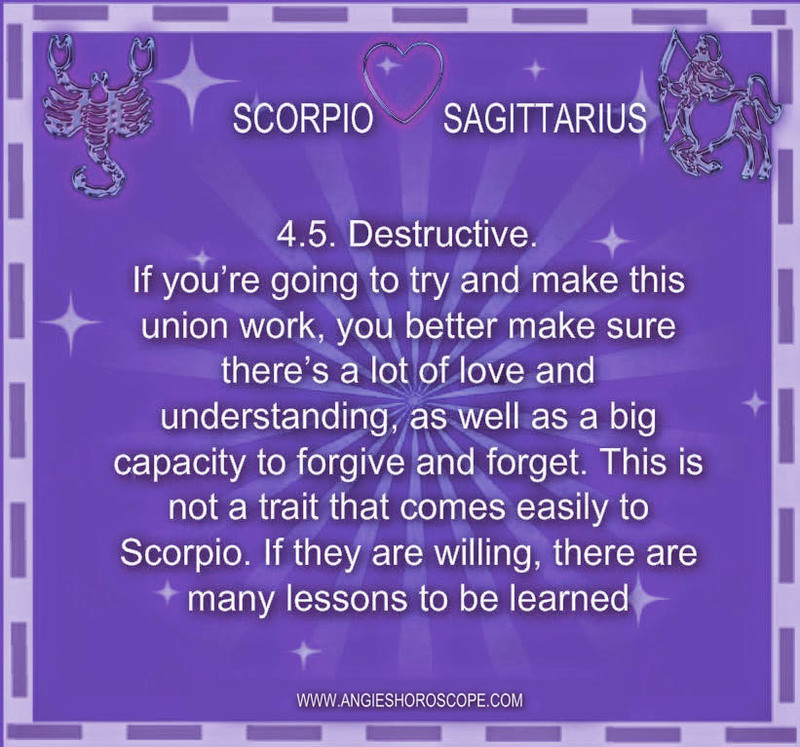 This is not a trait that comes easily to Scorpio. If they are willing, there are many lessons to be learned. 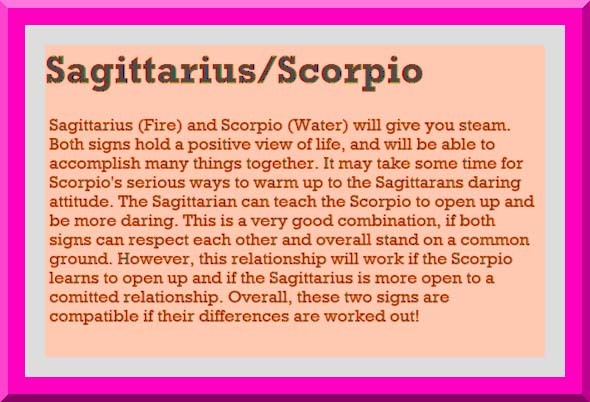 Sagittarius (fire) and Scorpio (water) will give you steam. Both signs hold a positive view of life, and will be able to accomplish many things together. It may take some time for Scorpio's serious ways to warm up to the Sagittarian's daring attitude. The Sagittarian can teach the Scorpio to open up and be more daring. This is a very good combination. If both signs can respect each other and overall stand on a common ground. 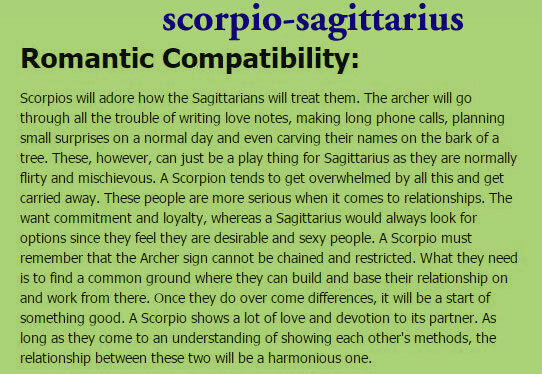 However, this relationship will work if the Scorpio learns to open up and if the Sagittarius is more open to a committed relationship. 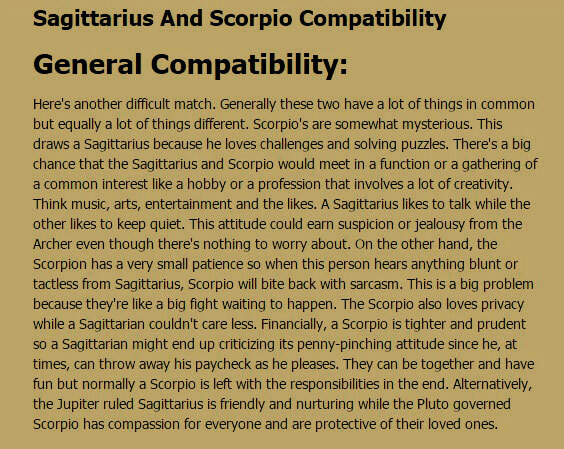 Overall, these two signs are compatible if their differences are worked out! The Sagittarius astrological sign is known for its bluntness. Natives of this sun sign are harshly honest. 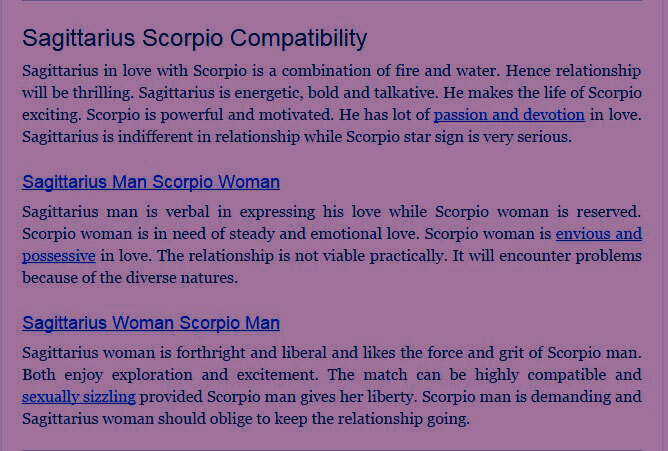 While this could upset many signs, it attracts the Scorpio lover. 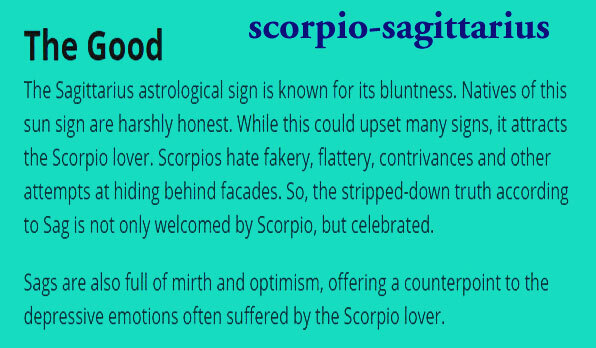 Scorpios hate fakery, flattery, contrivances and other attempts at hiding behind facades. So, the stripped-down truth according to Sag is not only welcomed by Scorpio, but celebrated. Sags are also full of mirth and optimism, offering a counterpoint to the depressive emotions often suffered by the Scorpio lover. This is a case of two different love styles trying to relate. 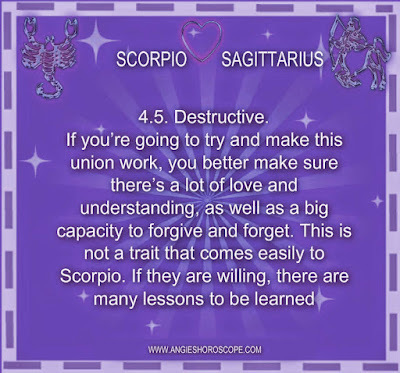 Sagittarius is fiery but not as emotionally deep as Scorpio who can be too passionately intense. 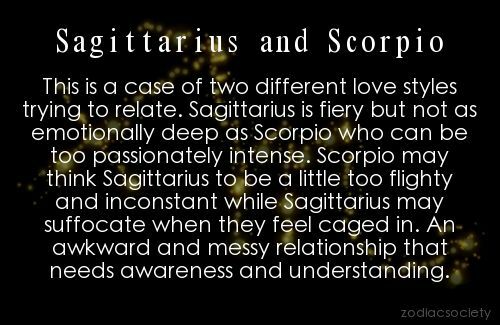 Scorpio may think Sagittarius to be a little too flighty and inconstant while Sagittarius may suffocate when they feel caged in. An awkward and messy relationship that needs awareness and understanding.